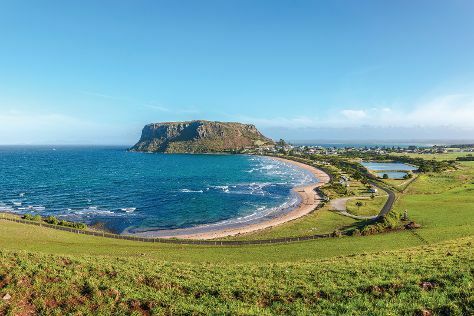 Stanley is a town on the north-west coast of Tasmania, Australia. On the 16th (Tue), look for all kinds of wild species at The Nut State Reserve, then contemplate the long history of Highfield Historic Site, then look for gifts at The Angel's Share, and finally don't miss a visit to Joe Lyons Cottage. To find photos, maps, reviews, and other tourist information, read our Stanley planner . Melbourne to Stanley is an approximately 2.5-hour combination of flight and taxi. You can also do a combination of flight and bus; or do a combination of ferry and car. Plan for little chillier nights when traveling from Melbourne in April since evenings lows in Stanley dip to 5°C. Wrap up your sightseeing on the 17th (Wed) early enough to travel to Arthur River. Start off your visit on the 17th (Wed): look for all kinds of wild species at Arthur-Pieman Conservation Area, then take some stellar pictures from Sumac Lookout, and then kick back and relax at Green Point Beach. On the 18th (Thu), you'll have a packed day of sightseeing: cruise along The Tarkine Drive and then make a trip to Edge of the World. To find traveler tips, reviews, ratings, and more tourist information, read Arthur River visit app . You can drive from Stanley to Arthur River in 1.5 hours. On the 19th (Fri), wrap the sightseeing up by early afternoon so you can travel to Cradle Mountain-Lake St. Clair National Park. Start off your visit on the 19th (Fri): examine the collection at Morrisons Huon Pine Sawmill and then take in the dramatic scenery at Hogarth Falls. On the 20th (Sat), you'll have a packed day of sightseeing: explore the fascinating underground world of Gunns Plains Caves, look for all kinds of wild species at Wings Wildlife Park, and then take in the dramatic scenery at Preston Falls. To see traveler tips, reviews, where to stay, and more tourist information, use the Cradle Mountain-Lake St. Clair National Park online trip planner . Drive from Arthur River to Cradle Mountain-Lake St. Clair National Park in 5.5 hours. Finish your sightseeing early on the 21st (Sun) so you can travel to Miena. Miena is a small town by the Great Lake in the Central Highlands of Tasmania, Australia. For photos, traveler tips, other places to visit, and tourist information, use the Miena trip maker site . Traveling by car from Cradle Mountain-Lake St. Clair National Park to Miena takes 4 hours. In April, daily temperatures in Miena can reach 20°C, while at night they dip to 7°C. Wrap up your sightseeing by early afternoon on the 22nd (Mon) to allow time for travel to Mount Field National Park. On the 23rd (Tue), you'll have a packed day of sightseeing: identify plant and animal life at Tall Trees Walk and then trek along Tahune Forest AirWalk. For more things to do, other places to visit, photos, and more tourist information, go to the Mount Field National Park holiday planner . Getting from Miena to Mount Field National Park by car takes about 2 hours. Expect a daytime high around 21°C in April, and nighttime lows around 9°C. Wrap up your sightseeing by early afternoon on the 25th (Thu) to allow enough time to travel to Campbell Town. Campbell Town is a town in Tasmania, Australia, on the Midland Highway. Kick off your visit on the 25th (Thu): tour the pleasant surroundings at Valentine Park and then steep yourself in history at Ross Female Factory. To see where to stay, other places to visit, and more tourist information, go to the Campbell Town trip itinerary planner . You can drive from Mount Field National Park to Campbell Town in 2.5 hours. In April in Campbell Town, expect temperatures between 20°C during the day and 7°C at night. You'll have a few hours on the 26th (Fri) to wrap things up before traveling home. Beauty Point is a town by the Tamar River, in the north-east of Tasmania, Australia. Your day-by-day itinerary now includes Narawntapu National Park. Kick off your visit on the 26th (Fri): explore the wealth of natural beauty at Narawntapu National Park. 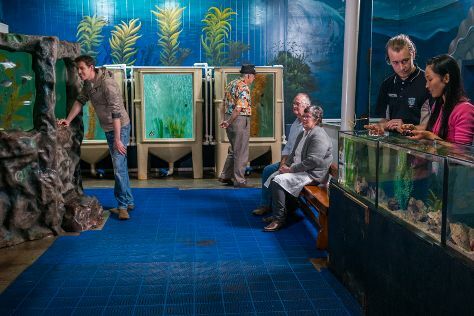 On your second day here, admire nature's wide array of creatures at Seahorse World, look for all kinds of wild species at Platypus House, then admire nature's wide array of creatures at Tasmania Zoo, and finally discover the riches below the earth's surface at Beaconsfield Mine & Heritage Centre. For photos, reviews, maps, and other tourist information, use the Beauty Point journey website . Drive from Campbell Town to Beauty Point in 1.5 hours. In April, plan for daily highs up to 20°C, and evening lows to 7°C. Wrap up your sightseeing on the 28th (Sun) to allow time to travel back home.